September 15th: New Activity--Going to see a movie based on a Video Game less than one week after its’ premiere in the theater. With movies being so expensive, I tend to be a bit more selective in what I see now than I did previously. I even try to catch the movies during matinee hours so I can get the cheapest rate. I am a big fan of horror movies (more old school than the mystery/horror movies), comedy movies (more situational than slapstick), and action movies (those with a plot I can relate to, not just shoot them up or fight movies). Usually, with movies based on Video Games, I tend to wait until they come out on DVD—they don’t call to me to be seen in the theater. However, my someone special is big into the movies based on video games, movies based on racing (Fast and the Furious) or plots regarding investigation, anti-cop, or vigilante justice. 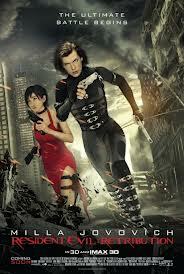 So with Resident Evil: Retribution coming out on this past Friday, I sensed he really wanted to check it out. I admit I hadn’t had a chance to look at all of the previous movies leading up to it but the action shown in the previews intrigued me. I am very glad the local movie theater reopened. For upon its’ reopening, you can go to any movie at any time for $5.00 compared to paying an arm and a leg at AMC. Sure, the theater itself isn’t as fancy, but if you are getting such a great deal on getting in the movie, how worried are you about the fanciness of the theater? The action in it was top notch. I still was able to somewhat follow it since the first couple of minutes gave a synopsis of what happened in the others. There weren’t any moments where the action dragged—you felt like you were in a video game. So it was definitely worth my $5.00.